W. H. Peter Madorin Q.C. 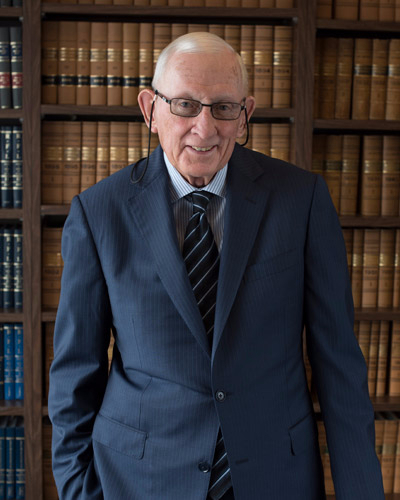 Peter has over 53 years of litigation experience representing both plaintiffs and defendants, and is certified by the law society as a specialist in civil litigation. Peter is the senior partner of the firm. He attended law school at Dalhousie University and was called to the Bar in Ontario in 1964. He practised law with the present firm (Madorin, Snyder LLP, as it is now known) from 1964 onward, originally as an associate and since 1966, as a partner. In 1979, Peter was appointed Queen's Counsel. In 1988, he was certified as a Specialist in Civil Litigation by The Law Society of Upper Canada and has been re-certified continuously from that date forward. Currently, he serves as a "Mentor" in the Mentorship Program sponsored by The Law Society of Upper Canada. Most recently, in April, 2005, Peter was awarded The Coulter A. Osborne Award for Integrity, Comity and Beneficence in the Legal Profession by the Waterloo Law Association. For the last several years he has been selected by his peers for inclusion in "Best Lawyers in Canada" for Kitchener and the Legal Lexpert Dictionary as a leading Insurance Law practioner. Peter's practice is restricted to civil litigation, primarily in the areas of corporate commercial, employment, environmental, real estate litigation, personal injury, and insurance. Within the area of insurance law, Peter's practice is focussed on the representation of insurers and the defence of claims brought against municipalities, professionals, hospitals, owners/occupiers of properties, and insurers themselves. Peter's trial experience includes numerous attendances in the Ontario Superior Court of Justice, Ontario Divisional Court, the Court of Appeal for Ontario, and various administrative tribunals. He is a long-time resident of Waterloo Region. He is a member of the Law Society of Upper Canada, Ontario Bar Association, Advocates' Society (Past Director), Association of Trial Lawyers of America (Sustaining Member), Canadian Defence Lawyers, and the Waterloo Law Association (Past Trustee).